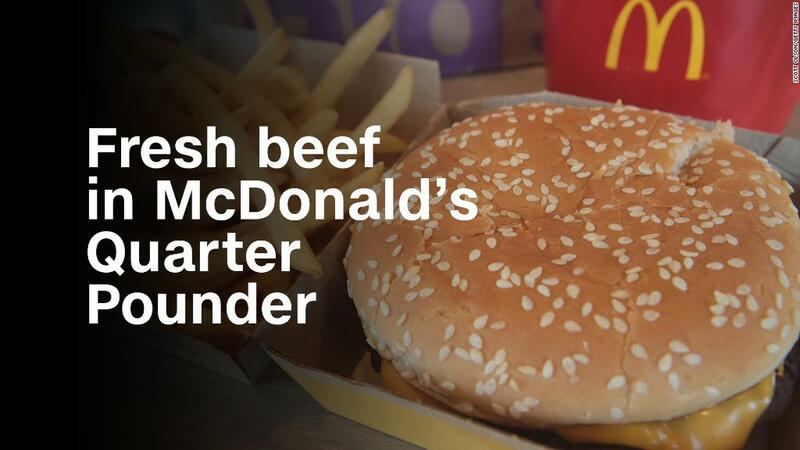 McDonald's is raising prices, and it's not scaring off fans of the Big Mac. More customers showed up at the Golden Arches for the fifth quarter in a row. Demand was strong in the United States, Europe and China. Shares of McDonald's (MCD) rose 5% in early trading Monday on the news. The company has wowed Wall Street and won back customers under the leadership of Steve Easterbrook, who took over as CEO in March 2015. McDonald's is emphasizing its trademark value options, but raising prices for burgers, fries and other items elsewhere on the menu. Why are menu prices going up? Commodity costs are rising around the globe — particularly for food. Several restaurants and consumer products companies are increasing their prices so profits don't take a hit. But passing on those higher costs to customers clearly didn't hurt McDonald's. The stock rose after it reported earnings and sales that topped forecasts. The company has wowed Wall Street and won back customers under the leadership of Steve Easterbrook, who took over as CEO in March 2015. Raising prices wasn't a problem for Chipotle (CMG), either. The Mexican food chain reported solid sales and profit last week, in part because of higher prices on the menu. More companies are realizing that if there is strong demand for their products, the economy is healthy enough that customers will pay more. Netflix (NFLX) recently raised subscription prices, and that hasn't hurt subscriber growth at all. Amazon (AMZN) announced last week that it is raising the price of its annual Prime service from $99 to $119. At McDonald's, overall sales were down because the company is selling more of its corporate-owned restaurants to franchisees. But same-store sales growth, which measures the performance of restaurants open at least a year, was stellar. Same-store sales rose 2.9% in the United States and 5.5% globally, led by strong results in the UK, Germany, China and Italy. Those are the numbers that Wall Street cares about. McDonald's has introduced several new menu items during the past three years that have been hits with customers, such as kale salad, a burger with Sriracha sauce and fresh beef in its Quarter Pounders. So McDonald's isn't just benefiting from higher-priced burgers and fries. It has also embraced technology more under Easterbrook, and that's attracting more customers. McDonald's now has an app that lets customers order and pay on their phones. It's experimenting with self-ordering kiosks in restaurants. And it has a delivery partnership with Uber Eats. Wall Street is a big fan of all these changes, too. McDonald's stock is up nearly 70% since Easterbrook took over in 2015. That's more than twice the gain of the S&P 500 and top rival Restaurant Brands (QSR), the owner of Burger King, during the same time. McDonald's stock has outperformed Yum Brands and Wendy's (WEN), too.